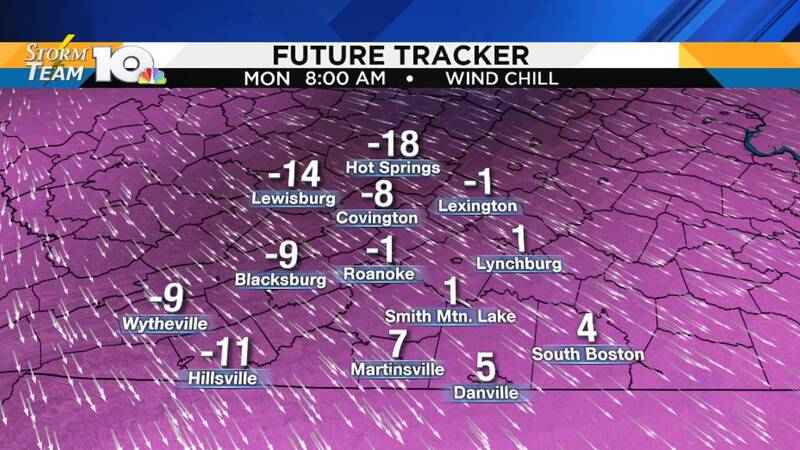 ROANOKE, Va. - The wind continues to be relentless and now it’s teaming up with the cold to create wind chills well below zero along and west of 81 and in the single digits across Southside. Highs today will climb into the upper-20s and low-30s, but it will feel like the teens with the wind factored in. The wind calms down later tonight. Sunshine continues tomorrow as we gradually warm up. By Wednesday we will jump back into the 50s! Rain chances return late Wednesday evening and into Thursday. As cold air blasts in again, the rain may change to a little snow, especially along and west of I-81.